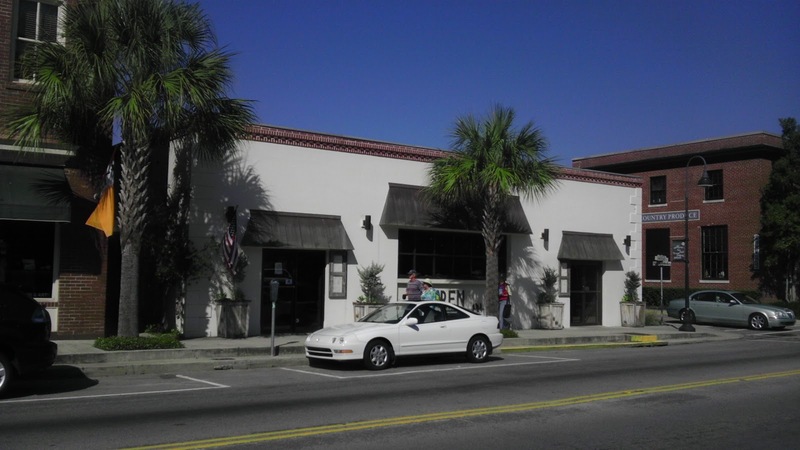 The Gentleman Crafter: My Day in Beaufort, SC! 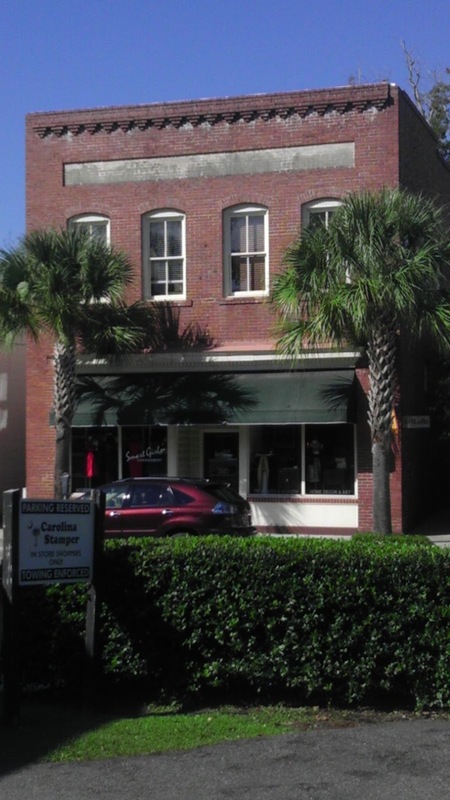 Didn't get a chance to blog yesterday afternoon about our little hop over to Beaufort, SC and wanted to do that now. I had an incredible day yesterday! 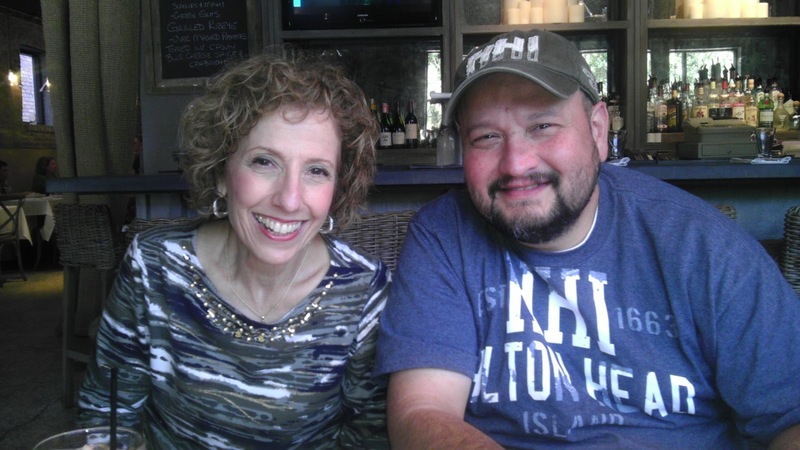 So fun and full of laughs with my friends Cesar and Marsha. 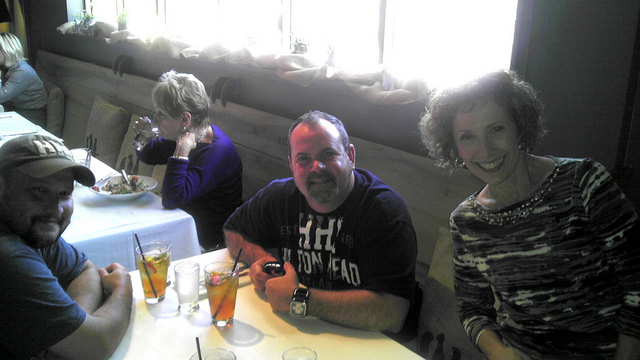 Here they are at MY FAVORITE RESTAURANT in Beaufort...WREN! Such a great picture! Just because this is my blog, I had to have a picture too! LOL! Just a note here...We struck up a conversation (go figure!) with the lady to my right... or actually in this picture to the left... sipping on lemonade. Believe it or not she was born in raised in North Texas and moved to this area 15 years ago!!!!!! Can you believe it! LOL! Y'all, The Peach Ceylon tea is OUT OF THIS WORLD good! 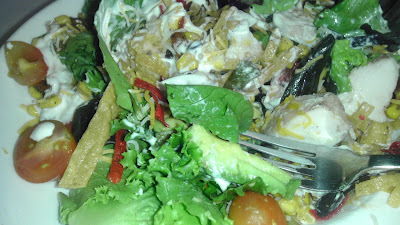 So was the Southwest Salad! OMG!!!! Roasted corn, tortilla strips, greens, tomatoes, black beans and the most scrumptious chicken breast! Oh Lawd it was good! Next it was on to MY FAVORITE STAMP STORE...the Carolina Stamper to visit my friends Janet and Sharon! Y'all, this store IS THE COOLEST and these two ladies are the sweetest, kindest, and most helpful you will find. 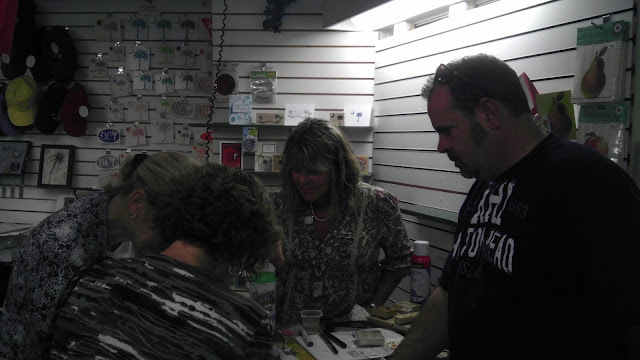 Here is a shot of us trying to get Marsha into the stamping thing! Intense huh? I think one of the coolest things there is, is to watch someone who has never stamped a single thing in their life totally get excited to learn something new! So cool! To end the day up, we all went to dinner back on HH Island at another amazing restaurant, Truffles! What a wonderful day! Today, I find myself wanting to craft and take it easy. If you're away from crafting for a couple of days, it sure makes you CRAVE it! So a bike ride this morning, some crafting and then a sunset bike ride on the beach seems to be a perfect way to spend the day. Thanks for joining me on my vacation to South Carolina y'all! looks like a fun day was had by all!! Love the pink gingerbread house...is that the restaurant you went on HH? Cute. So....did you have to rent a trailer after the carolina stamper? BTW having a great time on your vacation! There is drool on my keyboard from your salad pic! I bet that would be good with some SC fried shrimp too! Hmmmm, now there's me a dinner idea! OMG I lost my Favorite Things list!! Just kidding! I'm having a wonderful time on your vacation! A wonderful day with good friends is priceless. The food doesn't look too shabby either. What a great little town. How fun. I love to shop, site see, and walk around those old towns. That would be one of my favorite things. Just saying. I would say again, enjoy, but I can tell that that is just what you are all doing. So continue to your vaction journey. Love all the pictures. Makes me feel as though I am on vacation with you guys. What fun. I want to be there instead of here with an impending root canal! That salad looks so yummy I would even eat it, tooth pain and all! I have to laugh at the picture of you standing over Marsha. You look like you will beat her if she does not comply with those stamps! HA! And then you look like you want to just jump in there and do it yourself! So glad you are relaxing and having a good time. Nothing better than spending leisure time with friends. (Hi to my new pal Cesar... you are a teddy bear!). I checked out Archivers for you last night. 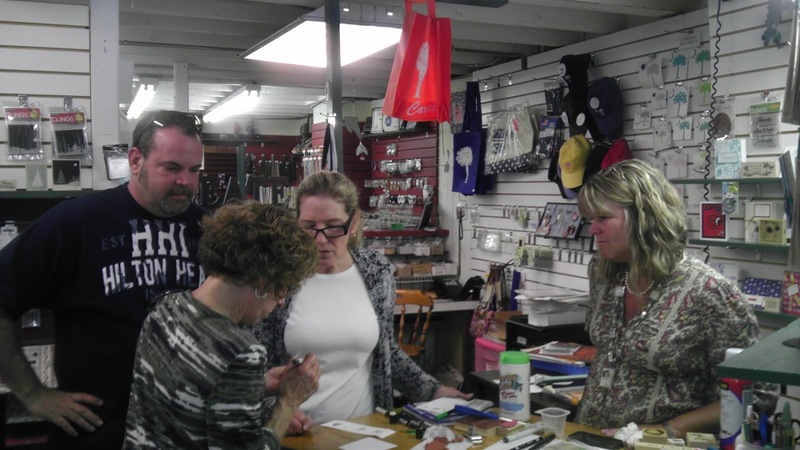 They have the Tim Holtz mirror sheets. I left you one (bwahahahaha). The weather there looks wonderful... beautiful blue skys. Now run off and go get yourself some peanuts! It sounds like you had a fantastic day. I sure wouldn't mind being there instead of back here in rainy England. Your Beaufort Day sounds like it was a perfect day! In fact, your plans for today sound perfect too! Hoping your weather is as spectacular there as it here in North Carolina.... I'm near Mt. Airy. Yep, the Andy Griffith Mt Airy. I'm actually closer to Mount Pilot (Pilot Mountain in real life). Wellll... I'm off to do some creating in my studio this afternoon too.... :o) Thanks for sharing all your fun with us. I'm in for the retreat idea next time so we can all go with you on vacation for real....LOL. 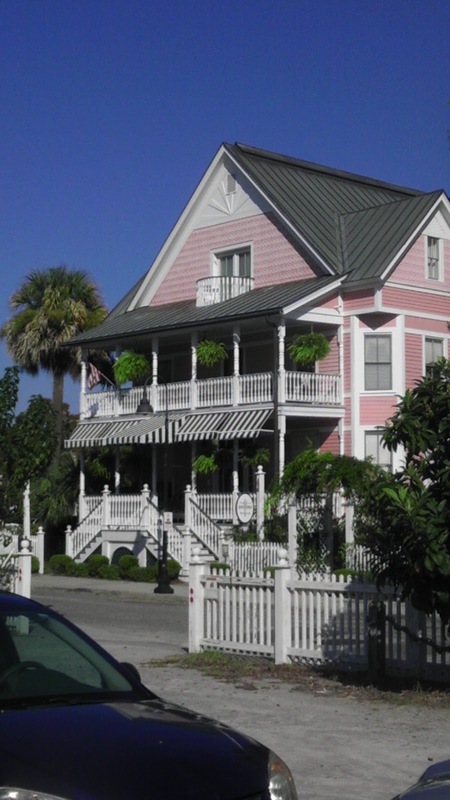 Hi while you were visiting Beaufort, hubby and I were driving home form HHI back to WV. Hope your stay is as wonderful as ours. I have never been to Beaufort. When I did a computer 'look see' of the area there was only one craft shop shown...do not think it was the one you visited. Could you give directions, or do they have an email address - would love to visit next time we are down there. (Probably next year now). 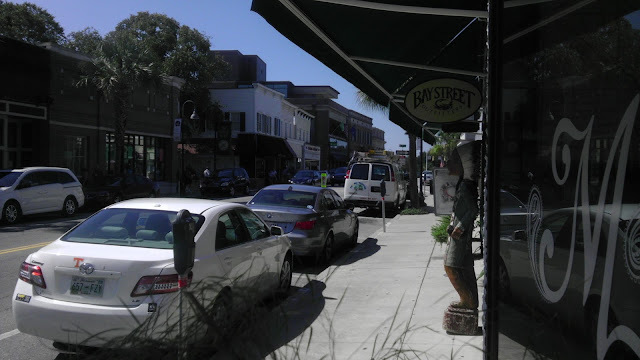 What about on HHI any tips for shopping there? As you can see I am neither an explorer nor a shopper! Yesterday looks like it was a lot of fun!! I'm anxious to see what you create today...will you be sharing or is it a secret for now? 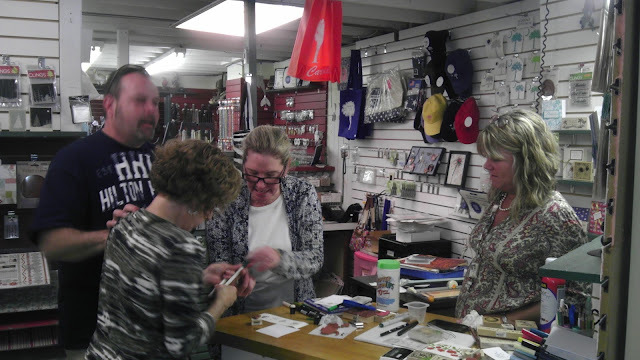 Love seeing Marsha learning to stamp...have you converted her? You look like you are having a grand time! Now this is my idea of a good vacation-relaxing, crafting, and eating good food. Thanks for taking us along. So, is my mind playing tricks on me or are you and Cesar wearing matching shirts? I've gotten behind in my favorites list so I'm off to backtrack and get um all. Have a wonderful evening. Jim, they say "there is nothing finer than being in Carolina" asnd isn't that the truth? I have lived here for 25+ years and love it so. Thank you for having us on your vacation. It has been so wonderful to feel like we are experiencing it with you. And oh yes....I have been keeping up!! I have a little notepad next to my computer with all my scribbles on it!! So what did you buy at Carolina Stamper then? Looks like you had a great time. Has Marsha been converted to a fully fledged stamper now? Like Amber, I have a notepad by my laptop and am jotting down your favourite things as we go along! Can't wait to see what's next! Jim the meal you had at Wren sounded so yummy. When you don't post for a while it makes me smile because I know you are out enjoying yourself. 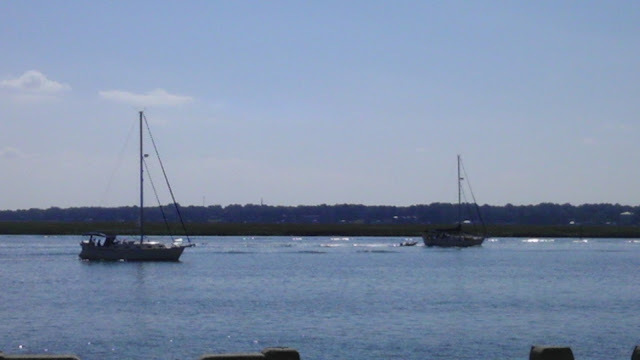 Have you been out on the water? Hope you are having the best time. I have relatives in Texas, Deer Park area, but Texas is a huge state. Spent 3 weeks there a long time ago. Flew into |Houston and then onto an airport called Hobby. Had a fabby time especially in the restaurants they are amazing. I'm so glad you are getting some time to rest and relax. I haven't had a chance to be in my studio since last Tuesday. We had a wedding going on here, and I was spending all my time cooking and doing flower arrangements and running around like a chicken with my head cut off. But my baby boy is hitched now, and I can get back to work. I'm getting caught up on all your favorites....it's so much fun! Thank you for sharing your vacation and your talent...both have brightened my days. I all your dreams come true today and everything you try works perfectly, first time out.